The Vietnamese General Vo Nguyen Giap has died. Throughout what was once known as the Third World as well as among those with revolutionary consciousness in the centers of imperialism, we pay tribute to one of the most important figures of the struggle of the oppressed for national liberation and socialism. General Giap, the skilled politician and brilliant military strategist who came to prominence by defeating the French forces in the epic battle of Dien Bien Phu during the spring of 1954, served as a teacher and inspiration to countless revolutionaries worldwide. His revolutionary vocation began during his student years and led him first to journalism and teaching. In the early ’30s he joined the Communist Party of Vietnam, which was brutally suppressed by the French colonial regime. Like many of his comrades, he was imprisoned and forced into exile. It was during a period of exile in China that he forged ties with Ho Chi Minh and the group of revolutionaries with which he would found the League for the Independence of Vietnam, better known as the Viet Minh. Upon returning to Vietnam in the mid-40s, he participated in the organization of the resistance movement that put an end to the Japanese occupation and with the proclamation of the Democratic Republic of Vietnam in 1945 he took the post of commander in chief of the People’s Army. His military career would lead him to successive victories over French and American forces in protracted wars that exemplified an unparalleled understanding of the dialectic of the main strategic categories of military science. It comes as no surprise that in the imperialist press there is an attempt to tarnish Giap’s legacy with claims of a supposed disregard for human life. The New York Times and other organs of imperialism that have published obituaries make repeated references to the large number of losses suffered by the Vietnamese troops under his command as a diversion from the real crimes committed by the war machines of France and the US, those responsible for the slaughter of hundreds of thousands of defenseless peasants through indiscriminate bombing campaigns with napalm and agent orange. This level of hypocrisy is common among the mouthpieces of imperialism who now try to play down Giap’s military genius while exculpating the real authors of so much death and destruction, Western companies that make up the military industrial complex – including manufacturers of biological and chemical weapons like Monsanto and Dow – and their political representatives who continue spreading this destructive force throughout the world today. Among serious students of history, especially those with a revolutionary orientation, it is common to appreciate the counterposition of the strategic factor of time to the superiority of firepower held by the imperialist armies employed by General Giap. It is important to remember, however, that Giap always stressed the primacy of the political prerequisite for these strategic conceptions: the ideological and political education of the people, organized as a people’s army. 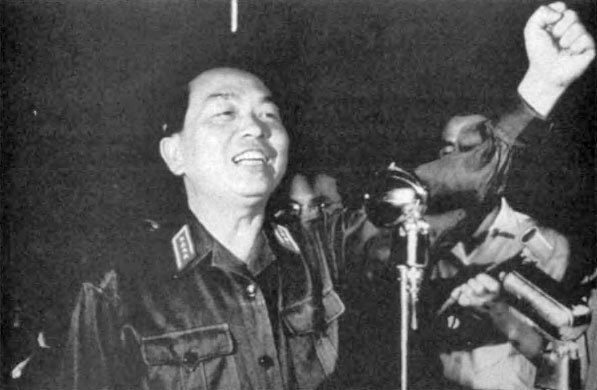 In the end, it was the indomitable fighting will of the Vietnamese people, a will consistently and patiently cultivated by dedicated political cadres, that defeated the modern weapons of imperialism on the battlefield and intensified the internal contradictions of a society half a world away. For our generation, the enduring legacy of a figure like Giap lay more in his ability to contribute to the political maturity of the Vietnamese people than in his military merits, notwithstanding his impressive achievements in this field. The central challenge of our time lay in cultivating the acquisition of a high degree of political consciousness by the exploited and oppressed along with the will to fight to collectively free ourselves from the shackles of oppression. We live in an era in which, both in the centers of capitalism and the periphery, the ruling classes maintain their dominance through the systematic perversion of consciousness. This is the most powerful weapon to keep the masses subdued, and the biggest obstacle to be overcome. It is in a figure like General Giap, however, that we find an example worthy of emulation that serves to inspire us to continue the struggle against oppression and exploitation. This entry was posted in Anti-Imperialism, Armed Struggle, Asia, Communist Party of Vietnam, East Asian & South Asian Liberation, French Imperialism, Imperialism & Colonialism, Imperialist Massacres, Imperialist War, Internationalism, National Liberation, U.S. Imperialism, Vietnam. Bookmark the permalink.